Ellie was first introduced to yoga whilst travelling in India in 1996 during which time she developed a deep self- practice and love of yoga. In 2006 she officially began to teach yoga which for her was a natural progression from her extensive background in alternative therapies and sports therapy. 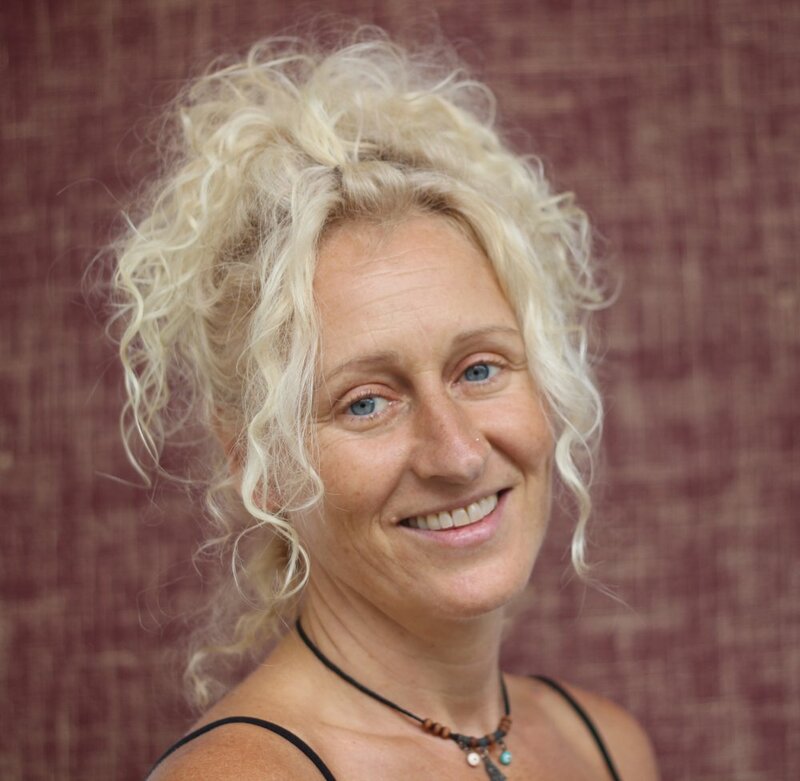 Ellie is passionate about sharing the knowledge she accumulated over the past 20 years of study, practice and teaching and her teaching style reflects her knowledge of anatomy and the physical body as well as the spiritual aspects of yoga. She believes that yoga is a constant journey of learning; Ellie has teaching qualifications in Rocket yoga, Vinyasa flow and Ashtanga as well as a 500hr advanced teaching qualification in Dharma yoga, she is also trained in sports therapy. She takes the key poses of the Dharma asana......twists, balances, inversions and backbends and combines them to create a dynamic and fun flowing practice. She always ensures there are plenty of variations for all levels of students and you are always encouraged to practice mindfully and without ego, listening to your body and allowing body and breath to flow together as one making your practice no matter how dynamic into your moving meditation. Yoga has been an important part of Sarah’s life since childhood, with humble beginnings copying her mum’s home practice as a tot. Growing up, she explored yoga in parallel to 12 years of classical ballet training to enhance her strength and flexibility. Although the physical aspect of yoga initially interested her, throughout teen years, Sarah began to use yoga as a tool to manage stress, anxiety and depression. The yoga mat became the one place that she could express her true self. Completing a 200-hour yoga teacher training in 2015 felt like the natural progression for Sarah to advance her understanding of both the physical practice and philosophy of yoga. Since then, she has set up several successful community and corporate classes in South East London including working with a local Rugby team and incorporating yoga into physiotherapy rehabilitation programs with NHS patients. In Sarah’s classes, anticipate to be led through a joyful and creative sequence, using your breath to guide you deeper into your strength and flexibility against an inspired soundtrack (and maybe an arm balance or two!). Yoga has been a part of Katie’s life since 2013. She stumbled across it almost by accident, but as soon as she began the practice she fell in love with all aspects of the ancient traditions and began to incorporate it daily into her very modern world. Yoga enabled Katie to cultivate a stronger, more flexible body as well as a calmer, freer mind. After 3 years of self-practice and self-enquiry Katie flew to India to learn a little more about the practice and about herself and, after a month of intense study, she completed her 200hr Ashtanga training in 2016. However, it wasn’t long after her return that she wanted to learn more so in 2017 she also became certified in Vinyasa Flow. With a strong understanding and commitment to alignment in asana as well as a background in dancing Katie’s classes are creative, strong and dynamic. She will help you find strength in body, as well as peace in mind as each class is interwoven with varying aspects of the yogic philosophy. She never takes things too seriously so while Katie will provide you with the tools to wring out the body and calm the mind, you’ll always have fun along the way. Vinyasa allows for a lot of variety, but will include sun salutations and flow sequences. Expect to move as each movement is synchronized to breath. The breath is given primacy, acting as an anchor as you move from one pose to the next in a fun but conscious way. Allison began teaching over 25 years ago as a group exercise fitness instructor. She has always enjoyed ‘movement’ and realised over time that teaching was her passion. Although Allison’s classes were high intensity, she discovered the benefits of ‘slowing down’ when she started taking Yoga classes. In order to progress into the subtle aspects of training the body, she qualified with the Michael King Institute in Mat Based Pilates in 2004. Her knowledge of Pilates helped her recover from a skiing accident and intensive knee surgery in 2007, which also led her to practice Yoga on a deeper level. This allowed her to heal and to be more aware of her body – which is where her Yoga journey really began. Allison is inspired and influenced by various teachers around the globe. Allison completed her 200-hour YTT in India in 2013, 120-hour Hridaya Module in Mexico 2015, and completed a 300-hour YTT in India in 2018. Amongst other trainings, she has also completed a Yin-Yoga course with Norman Blair earlier this year. Allison’s classes are fun, dynamic, focused on alignment, relaxing and full of flowing energy – she emphasizes on connecting with the breath in both Yoga and Pilates as this allows us to always be present and aware. Giovina came to yoga about 9 years ago and clearly remembers that, after coming out of her first class, she felt so alive and present. Coming from a background of dance, fitness and theatre body movement she has always been fascinated by the ways our body can communicate, feel and express while creating an inner safe space to develop self-awareness, acceptance and love. She completed her 200-hours TT in Ashtanga Vinyasa in 2006 at Breeze, followed by a 50-hours Rocket training with It's Yoga International, led by Jamie Blowers and has been regularly teaching for the past 3 years. What she aims to do in her classes is creating a supportive, welcoming and pressure-free environment. The intention is to provide balanced challenges for the body, the mind and the ego by inviting students to listen to their body, befriend their breath and embark on their own unique journey towards becoming their best version of themselves while having fun at the same time. Besides teaching yoga, both to adults and children, Giovina is also qualified to teach aerial yoga and has recently successfully completed her Diploma in Therapeutic Counselling. That moment made me laugh so much and still puts a smile on my face whenever I think about it.